Welcome to the Third Annual Narrative “Tell Me a Story” High School Contest! This page is for you—students and teachers—and will serve as the epicenter of all contest information and activity. Please be sure to visit often for answers to any questions you may have. You may already know that it’s central to our mission to discover, mentor, and publish the next generation of talented writers. That’s where you come in. The “Tell Me a Story” High School Contest grew out of our belief that there are stories yet to be told and young writers poised to tell them. 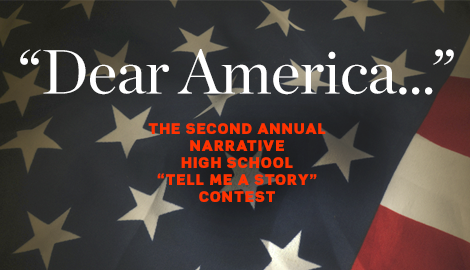 This year, as we launch the Third Annual Narrative “Tell Me a Story” High School Contest, we’re excited to welcome more classrooms across the U.S. and abroad—and to read every unique story that only you can tell. Prompt: “When everything changed.” Please submit a 600-word personal narrative, or, new this year, a piece of short fiction that responds to the prompt “When everything changed.” In 600 words or less, tell us about a crucial moment of change in your life or in the life of your characters. It doesn’t have to be a big moment, in the sense of an earth-shattering crisis, it just has to feel vital to you—and, most important, to your reader. Capture a moment in time, and then tell us what followed from that. 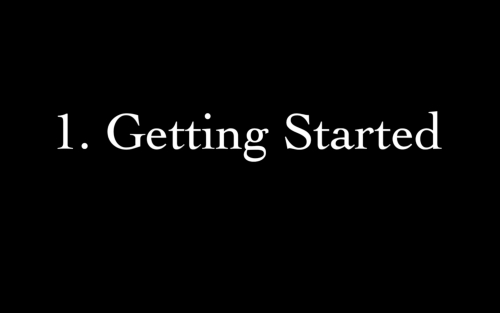 To get some ideas about how to begin your piece, watch this short tutorial from bestselling author and Narrative cofounder Carol Edgarian. Who can enter? Sophomores, juniors, and seniors are eligible to submit to the contest via their teachers, starting in January 2018. The contest is free to enter for all eligible students. Our list of partnership schools is finalized for this year's contest, but if you are interested in participating, please don't hesitate to contact us. We are always eager to expand our reach. When’s the deadline? The contest submission deadline is March 1, 2018. We will announce the winners and finalists in April. Details, details: What should a submission look like? Manuscripts should be double-spaced and in 12-point type, with one-inch margins and numbered pages, and must be unpublished (that includes blogs). Your name, school, English teacher, class period, and email address should be typed in the top left corner of the first page. And remember: start by signing on to Narrative with your name and email, so we can find you! What do Narrative editors look for? We’re looking for personal narratives and short fiction that show how small events speak universal truths about who we are in the world. That’s why this year we chose a prompt—when everything changed—that invites you to reflect on a moment of transition and/or growth. Begin your essay or story with a singular moment, and develop it from there. The moment itself may be small or large. We encourage you to pick a story that truly matters to you. Can I read other work published in the magazine? Absolutely! Join us by making a free account here. How do I submit? Students must share submissions with their high school English teachers, who will submit stories and essays on their students’ behalf. Awards: The winners of the Narrative “Tell Me a Story” High School Contest will receive $800 in prizes, be edited and mentored by Narrative cofounder and bestselling author Carol Edgarian, and see their work published alongside many of today’s great authors in the magazine. The winners and their works will also be featured on Narrative Outloud, the Narrative podcast. And here’s an instructional video to help you get started. More videos can be found here.